Lahaina is the largest census-designated place (CDP) in West Maui, Maui County, Hawaii, United States and includes the Ka'anapali and Kapalua beach resorts. As of the 2010 census, the CDP had a resident population of 11,704. Lahaina encompasses the coast along Hawaii Route 30 from a tunnel at the south end, through Olowalu and to the CDP of Napili-Honokowai to the north. During the tourist season, the population can swell to nearly 40,000 people. Lahaina's popularity as a tropical getaway has made its real estate some of the most expensive in Hawaii; many luxury homes and condos sell for more than $5 million. In antiquity Lahaina was the royal capital of Maui Loa, aliʻi nui of the island of Maui, after he ceded the royal seat of Hana to the ruler of Hawaii Island. In Lahaina, the focus of activity is along Front Street, which dates back to the 1820s. It is lined with stores and restaurants and often packed with tourists. The Banyan Court Park features an exceptionally large banyan tree (Ficus benghalensis) planted by William Owen Smith on April 24, 1873, to commemorate the 50th anniversary of the arrival of Christian missionaries. It is also the site of the reconstructed ruins of Lahaina Fort, originally built in 1832. It is the largest Banyan Tree in the United States. Lele was an ancient name of Lahaina. The Hawaiian language name Lā hainā means "cruel sun", describing the sunny dry climate. Lahaina's historic district averages only 13 inches (330 mm) of rain per year, much of which occurs from December to February. In 1795, before unification of the islands, the town was conquered by Kamehameha the Great. Lahaina was the capital of the Kingdom of Hawaii from 1820 to 1845. King Kamehameha III, son of Kamehameha I, preferred the town to bustling Honolulu. He built a palace complex on a 1 acre (0.40 ha) island Mokuʻula surrounded by a pond called Moku Hina, said to be home to Kiwahine, a spiritual protector of Maui and the Pi'ilani royal line, near the center of town. In 1824, at the chiefs' request, Betsey Stockton started the first mission school open to the common people. It was once an important destination for the 19th-century whaling fleet, whose presence at Lahaina frequently led to conflicts with the Christian missionaries living there. On more than one occasion the conflict was so severe that it led to sailor riots and even the shelling of Lahaina by the British whaler John Palmer in 1827. In response, Maui Governor Hoapili built the Old Lahaina Fort in 1831 to protect the town from riotous sailors. Lahaina was the capital of the Kingdom of Hawaii from 1820 to 1845, when the capital was moved back to Honolulu. In the 19th century, Lahaina was the center of the global whaling industry, with many sailing ships anchoring at its waterfront; today pleasure craft make their home there. Lahaina's Front Street has been ranked one of the "Top Ten Greatest Streets" by the American Planning Association. Lahaina is located at 20°53′10″N 156°40′29″W﻿ / ﻿20.88611°N 156.67472°W﻿ / 20.88611; -156.67472 (20.886122, -156.674602). According to the United States Census Bureau, the CDP has a total area of 9.3 square miles (24.1 km2), of which 7.8 square miles (20.2 km2) is land and 1.5 square miles (3.9 km2), or 16.26%, is water. 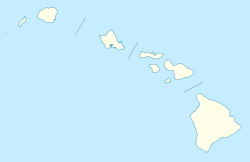 There are many different climates in the different districts of Lahaina. The historic district is the driest and calmest and hosts the small boat harbor. Kaanapali is north of a wind line and has double the annual rainfall and frequent breezes. The Kapalua and Napili areas have almost four times the annual rainfall compared to the historic district of Lahaina. Maui's west coast includes several different micro climates and wind lines. Lahaina's northern end gets four times as much rainfall as historic Lahaina and is cooler. The Kaanapali area of Lahaina gets twice as much rain as historic Lahaina. Lahaina has a tropical, semi-arid climate (Köppen BSh) with warm temperatures year-round. The southern end of Front Street is home to the largest Banyan Tree in the United States. The West Maui mountains have beautiful valleys visible from the historic district of Lahaina. The valleys are the backdrop for "the 5 o'clock rainbow" that happens almost every day. In 1831 a fort was built for defense, and the reconstructed remains of its 20-foot (6.1 m) walls and original cannons can still be seen. Also near the small boat harbor are the historic Pioneer Inn and the Baldwin House museum in the historic district of Lahaina. Hale Paʻi is the site of Hawaii's first printing press, including Hawaii's first paper currency, printed in 1843. The Plantation Course at Kapalua hosts the PGA Tour's Sentry Tournament of Champions every January. The many restaurants along Front Street offer a broad variety of food and entertainment, making it the hub of West Maui's night life. A variety of shops and galleries line both sides of the oceanfront Front Street. Carthaginian II was a museum ship moored in the harbor of this former whaling port-of-call. Built in 1920 and brought to Maui in 1973, it served as a whaling museum until 2005, and after being sunk in 95 feet (29 m) of water about 1⁄2-mile (0.80 km) offshore to create an artificial reef, now serves as a diving destination. It replaced an earlier replica of a whaler, Carthaginian, which had been converted to film scenes for the 1966 movie Hawaii. Halloween is a major celebration in Lahaina and has become a signature event, with crowds averaging between 20-30 thousand people. The evening starts off by closing Front Street to vehicles so the "Keiki Parade" of children in costumes can begin. Eventually, adults in costumes join in, and by dark the street becomes one big party. Some refer to Halloween night in Lahaina as the "Mardi Gras of the Pacific". In 2008 the celebration was curtailed due to the objections of a group of cultural advisers who felt Halloween was an affront to Hawaiian culture. In the following years the event was poorly attended, as the street was not closed and no costume contest took place. In 2011, citing economic concerns, the County permitted the annual signature event to fully resume. From November to May, whale watching excursions are popular with tourists. The peak season for whale watching in Lahaina is January–March. Each November, Lahaina hosts the Maui Invitational, one of the top early-season tournaments in college basketball. The event is sponsored by Maui Jim and is held in the Lahaina Civic Center. The Lahaina Aquatic Center hosts swim meets and water polo. Lahaina also hosts the finish of the Vic-Maui Yacht Race, which starts in Victoria, British Columbia, Canada. This race started in the 1960s and is held every two years. The historic district has preserved 60 historic sites within a small area and they are managed by the Lahaina Restoration. The banyan tree in Courthouse Square is the largest banyan tree in the United States. ^ "Profile of General Population and Housing Characteristics: 2010 Demographic Profile Data (DP-1): Lahaina CDP, Hawaii". U.S. Census Bureau, American Factfinder. Retrieved December 28, 2011. ^ "Hawaiian Real Estate Trends - A New Way to Look at Hawaii Realty". RealEstate.com. Retrieved 16 January 2013. ^ John R. K. Clark (2001). Hawai'i place names: shores, beaches, and surf sites. University of Hawaii Press. p. 23. ISBN 978-0-8248-2451-8. ^ Maui Historical Society. (1971) . Lahaina Historical Guide. Tokyo: Charles E. Tuttle, Co.
^ Pukui and Elbert (2004). "lookup of Lā-hainā". on Place Names of Hawai'i. Ulukau, the Hawaiian Electronic Library, University of Hawaii. Archived from the original on 2012-07-17. Retrieved 2009-12-31. ^ Pukui and Elbert (2004). "lookup of Lahaina". on Place Names of Hawai'i. Ulukau, the Hawaiian Electronic Library, University of Hawaii. Archived from the original on 2012-07-19. Retrieved 2009-12-31. ^ P.C. Klieger, 1998. The restoration of this site has been delayed. Moku`ula: Maui's Sacred Isle Bishop Museum Press, Honolulu. ^ Dodd, Carol Santoki (1984). "Betsey Stockton". In Peterson, Barbara Bennett (ed.). Notable Women of Hawaii. Honolulu: University of Hawaii Press. pp. 358–360. ISBN 978-0-8248-0820-4. OCLC 11030010. ^ "Lahaina Harbor History". Hawaii Harbors Network. Retrieved May 17, 2017. ^ Busch, Briton C. (1993). "Whalemen, Missionaries, and the Practice of Christianity in the Nineteenth-Century Pacific" (PDF). The Hawaiian Journal of History. Honolulu: Hawaiian Historical Society. 27: 91–118. hdl:10524/499. OCLC 60626541. ^ "Lahaina Maui, Hawaii, United States | Tourist attractions | Best Tours". www.vjcyber.com. Retrieved 2018-11-12. ^ a b "Maui's Front Street Named to Top 10 Great Streets for 2011 - Maui Now". mauinow.com. ^ "Geographic Identifiers: 2010 Demographic Profile Data (G001): Lahaina CDP, Hawaii". U.S. Census Bureau, American Factfinder. Retrieved December 28, 2011. ^ "Halloween Destinations". Travel Channel. ^ "Lahaina Aquatic Center". mauicounty.gov. Retrieved 2019-04-10. ^ "Lahaina, 96761 Crime Rates and Crime Statistics - NeighborhoodScout". www.neighborhoodscout.com. Retrieved 2018-11-12.